If you’re the parent of a small person with an avid disregard for shoes then don’t despair. You may not be able to show off the cutest of shoes but you can still showcase socks so make them showstoppers like these three dimensional wonders! That’s right, socks needn’t be boring. Zooni ConFEETi socks are both fun and functional. Made from cotton with a non-slip grip on each sole, they are oodles of fun for the wearer! 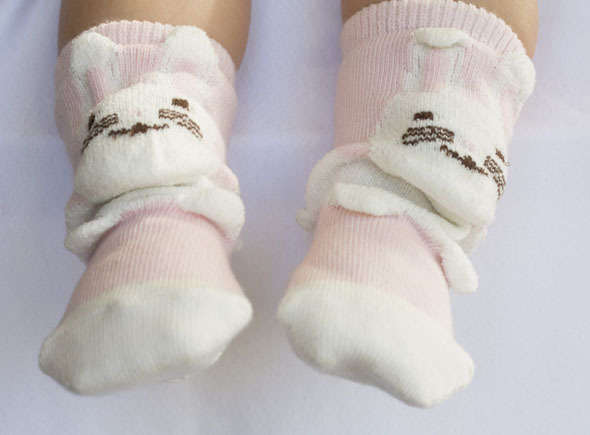 These socks have puffy bits like ears, feet, faces and paws that really do add a fun factor to your child’s footwear. If your little one has graduated to wearing shoes then they can still enjoy these socks because the three dimensional element sits above the ankle. The Zooni ConFEETi collection forms a complete menagerie including bunnies, monkeys, kittens and even teddies for bear lovers. Gift sets containing three pairs of socks are also available and are great value. Zooni ConFEETi socks cost $9.95 a pair and gift sets $24.95 and are available in Australia only at Monkey Caboose, who deliver Australia-wide.